Last year I was one of the lucky few to receive the ARTS COUNCIL ENGLAND’S Artists’ international development fund allowing me to develop our relationship with Munhwa theatre company Cong from South Korea based in the city of Busan. We were first introduced to them in November 2015 when one Monday afternoon the Director of the company (Jo Euna) knocked on our door at the actacentre. 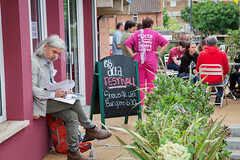 She had been in London for a week and had come across acta and wanted to find out more about community theatre. After an exciting conversation we agreed that if a funding opportunity arose we would work together in the future. A couple of months later we heard about the Arts Council grant and that is how it all began…. The grant enabled us to work together as individual practitioners but also with our theatre companies. The aim of the project was for us to share and learn from each other’s practice and experience and see whether there is an opportunity for us to work together in the future. In September, Euna and her colleague Sundue (Director from Munhwa Cong) came to spend a week at acta. They attended our weekly workshops and we timed their visit so they would be able to attend an acta show. We talked about how community theatre doesn’t exist in Busan and how they were keen to use acta as a model for creating their own work. We had many meetings discussing the structure, strategies and fundraising behind acta. We learnt that the majority of their shows are musicals and to support their performance’s they use a style of theatre called Sand Art. In February, it was my turn to go to Busan and I couldn’t wait! As part of our learning in Bristol we realised that a translator would be essential, allowing us to communicate and express ourselves clearly and easily. On the Monday I gave a presentation to a group of South Korean University students about community theatre, what it is and why it’s important. After this I was invited to participate in their Sand Art training workshop. Sand Art is something I’ve never had the opportunity to do and I thoroughly enjoyed it. Sand art is used in their live performances, by projecting the sand art images onto a screen as a backdrop for the scenes. In our training we learnt simple techniques to create incredibly effective sand art. The whole process, using the sand, felt rather therapeutic and I began to think of ways we could use this technique at acta. On the Tuesday, it was my opportunity to facilitate a practical workshop to the staff of Munhwa Cong and some of the actors they work with. I introduced them to new games, exercises and devising techniques, with clear explanations of the effects of them and why we do them. I couldn’t believe how transferable the games were and I felt pure joy watching them perform those games I’ve seen played so many times in Bristol performed in Korean. ‘When we heard it was a theatre workshop we thought we would have to stand on a stage and we would be scared, but it was much more fun, if I had known that, I would have invited all my friends’. They all agreed that it was so rare for them to have an opportunity to share their stories. After the workshop my translator told me how older Koreans rarely share their ideas and she couldn’t believe how engaged they were. On Thursday, two top drama therapists from Seoul came down to meet me. We had fascinating conversations, discussing the similarities and differences of our companies and the difficulties and successes we’ve encountered. I couldn’t believe that over 5000 miles away they were using the same games we use back here in Bristol. One key conversation during the week was about the role of a ‘facilitator’ – A person who supports, encourages, devises, script writes, directs and produces. We discussed how key this person is to the success of a community theatre project and how our facilitators at acta are highly skilled and experienced. 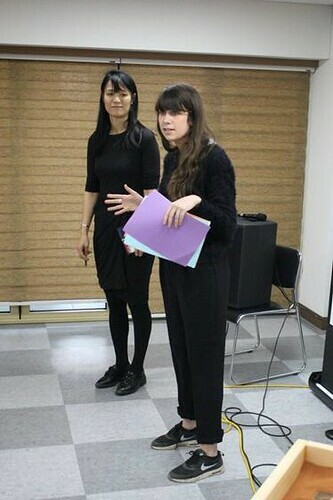 Euna talked about her staff and how even though they have Producers and Directors she does not feel these people are skilled enough to be ‘community theatre facilitators’ and without the right people to carry out the practice, how are they able to go forward with their dream. During my last day we talked about the future and how we could continue working together. Euna told me she’d like me to return to Busan next year and train her staff on facilitation and help them to plan a project working with the local community. Continuing my link with the Munhwa Cong theatre company is something I feel very passionate about. I feel so lucky to have trained at acta, that to have the opportunity to share my learning and skills, particularly in a place where community theatre does not exist, would be an absolute privilege.